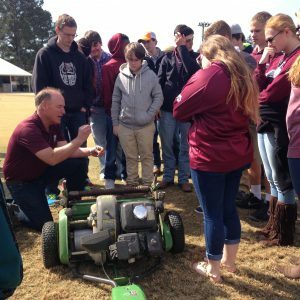 Approximately 35 high school students traveled from Brooklyn, MS (just south of Hattiesburg) on Monday, March 7, 2016 to visit various turfgrass facilities at Mississippi State University. Forrest County Agricultural High School teachers Mary Helen Lett (teaches Introduction to Agriculture), Mike Dale (teaches Agriculture and Natural Resources), and Rusty Coats (teaches Horticulture) accompanied the students on their trip. The first stop for the students was with two Mississippi State Assistant Golf Professionals, Ryan Wilhelm and Trey Adams. Ryan and Trey went over basic club grip and how to address the ball on the driving range, chipping green, and putting green. For many students, this was the first time they had ever attempted to hit a golf ball. The next stop was with Pat Sneed, Mississippi State Golf Course Superintendent. Pat discussed various aspects of golf course maintenance and demonstrated various pieces of equipment vital to produce high quality turfgrass, which included a topdresser, reel mowers (walk behind and triplex units), an aerifier, and a sprayer. The final stop of the morning was with Brandon Hardin (Mississippi State Athletic Field Manager). The students got a chance to visit Davis Wade Stadium and learn about the challenges associated with managing turf at a very high level. 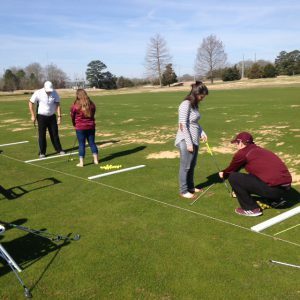 The Mississippi State University turfgrass team was on-site to provide information regarding the turfgrass program, such as the internship requirements, curriculum, and career opportunities. Overall, for many of the students, this was the first time they had the opportunity to swing a golf club and get an overall glimpse of what it takes to produce championship level turf on a golf course and sports field. We appreciate the efforts of Mary Helen Lett, Mike Dale, and Rusty Coats for bringing their students from Forrest County to Mississippi State University. The turfgrass team would also like to thank the efforts of Brandon Hardin (MSU Athletic Field Manager), Pat Sneed (MSU Golf Course Superintendent), Ryan Wilhelm (MSU Assistant Golf Professional), and Trey Adams (MSU Assistant Golf Professional) for their time and expertise throughout the day. Pat Sneed, Mississippi State University Golf Course Superintendent, provides an overview of a walk-behind mower commonly used to mow putting greens. Mississippi State Assistant Golf Professionals, Ryan Wilhelm and Trey Adams demonstrating how to hit a golf ball. Last updated March 1st, 2016. Technical problems, contact support.